"Working with Landmark students has taught me to be a better thinker, writer, and educator." 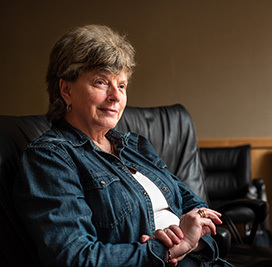 After 26 years of teaching Landmark College students about their learning process, Meg Murtha states that it is no surprise she has learned a few things about herself, as well. "I have become much more creative and flexible," she reflects. "Working with Landmark students has taught me to be a better thinker, writer, and educator." Prior to teaching, Meg lived in Washington, D.C., and worked on Capitol Hill for a U.S. Senator from Colorado. It wasn't until after she married, moved to Vermont, and became a mother that she pursued a career in education. Initially, she worked as a substitute teacher in the schools her children attended, filling in at every grade level and in all subjects, including the special education program. Meg came to Landmark College in 1992 as a tutor and quickly became affiliated with the Communications Department teaching both skills development and credit-level classes. "Our roles changed, especially in the early days, in response to institutional need," she reports. She even served for several years as the Director of the College Placement and Career Planning Office, visiting colleges and universities across the country to enlighten them about Landmark's special mission and to evaluate the level and type of support services these schools provided. It was while she was serving as both a Communications professor and advisor that Meg decided to commit to full-time academic advising. She especially enjoyed working one-on-one with students and often filled in at the Drake Center for Academic Support. She enrolled in an online program at Kansas State University and earned a Master of Science in Academic Advising degree where she achieved a 4.0 GPA and was inducted into Phi Kappa Phi, a national honor society for graduate students. Meg reveals that the secret to her academic success was applying all the same writing and study skills she had taught her Landmark students. "Everyone benefits from using a variety of approaches and having a tool box of strategies." In 2011, Meg received the Northeast Region's Academic Advising Excellence Award from the National Academic Advising Association. She believes the key to good advising is building strong relationships of trust with students. "Be welcoming and non-judgmental, listen actively, and establish a rapport with advisees," she recommends. "If you meet students on their own level and make them feel comfortable, you can support them in setting and achieving their personal goals." Meg's final group of advisees graduated this spring. Micah Sherman-Raz '18, who was among those 14 students, says, "Meg Murtha is someone who has shown me that no matter the challenge, it can be done if you put your mind to it. She taught me to remain positive even through tough times, and that made a world of difference for me." Even as she prepares for her next adventure, Meg continues to impact the learning experience at Landmark College. She recently redirected the funds for her retirement chair into a contribution for student scholarships and added a personal donation, as well. She asks that anyone who wishes to make a gift to the college in her name direct it to the student scholarship fund. "Being on the faculty at Landmark has given my life purpose, meaning, and structure," Meg reports. "I know without question that I have made a positive and significant difference over the years in the lives of many wonderful young people who learn differently. These relationships with students and with their families have expanded my personal vision/universe and given me a deeply-rooted sense of satisfaction and fulfillment."